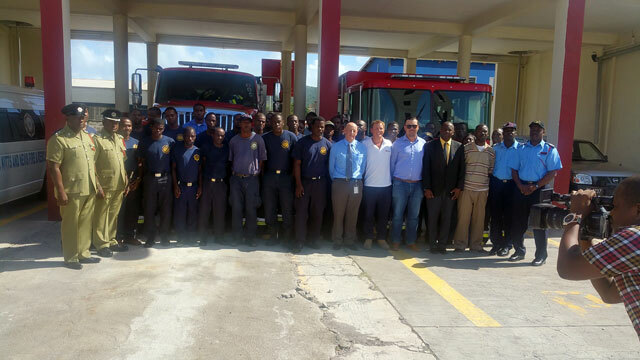 Basseterre, St. Kitts-The Fire and Rescue Services in St. Kitts and Nevis recently received a donation from a business entity to assist the organization in achieving its fire safety agenda. On Tuesday morning the Kier Group of Companies donated a printer, a multimedia projector and a laptop to the Fire and Rescue Services. Speaking to the media following the donation, Deputy Fire Chief (Ag) Abdias Samuel indicated that the donation for the business entity was a demonstration of its assistance and commitment to the fire service ensuring they have quality equipment. “Director Mr. Miller took some time from his schedule to donate these equipment to the fire services because of the excellent work the fire services has done and making sure the establishment has a first class fire safety system in place,” he said. Mr. Samuel disclosed that the new equipment would be used to assist with its Fire Prevention Program. He also gave some background on the Fire Prevention Program. “What it seeks to do is to ensure that business places, residential homes or commercial areas have adequate safety systems in place. We educate the general public about establishing fire plans in the event of an emergency happening what do you do and also how do you work along with the emergency response agencies ensuring you can help them be more effective and efficient,” he said. The Deputy Fire Chief also gave insight on how critical the donation was to their program. “They are very critical. It gives you mobility that you can present your information and use multimedia, social media and many mechanism in order to reach the general public in many ways. It gives us that interface of different options to reach the general public,” he said. Samuel also indicated that under the program they have partnerships with numerous business places and officers are sometimes charged with carrying out inspections at these entities. “These inspections are also done with our different partners like the Labour Department and Health Department …and if we find any infractions whoever jurisdiction it falls under, that agency is advised that these violations are there and the agency will take the necessary steps to get them rectify that problem,” he said. Also taking place on Monday was a competition between the Fire and Rescue Officers from the various stations across St. Kitts. Samuel stated that the competition was used to bring comradarie and competitive spirit among the officers. “The RLB fire hall came out on top and they were able to do the exercise and complete it in due time. They had to put on the gears, cut metal, lift and basic things that test their ability. This morning I am pleased to see that RLB Fire hall came out on top,” he said. The only female to participate in the event, Loretta Hodge, said she felt great participating in the competition and believed she could beaten all the other males. She also encouraged more females to take fire and rescue up as a career and use the chance to save lives as a motivation. “I feel women could work like men and do a just as good or even better job. I could compete against those guys and beat them,” she said.